A frequent question we receive at ReferralHero is: which of your tools should I use? Lead Magnet, Waiting List or Sweepstake? Which one is the best? 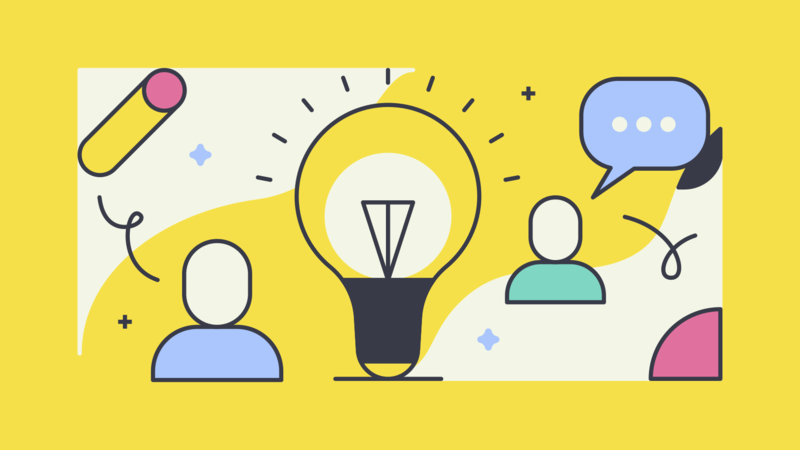 In this post, I will explain how these tools are different, and which one you should choose for your referral campaign. Viral waiting lists are a referral strategy popularised by companies like Robin Hood and Monzo. They are a waiting list… on steroids. People compete with each other to get to the top of the ranking. The more friends they invite to join, the further ahead in the queue they get. A Viral Waiting list is normally (but not always) used for pre-launches, and to recruit early-adopters. By using a time constraint (a deadline), and a leaderboard with public ranking, the goal of companies using a Viral Waiting list is to encourage competition amongst their subscribers. Viral Sweepstakes are like a raffle… with a twist. The winner (or winners) are still drawn randomly, but for each friend your users refer they get extra draws. With a Viral Sweepstake you basically turn the whole sweepstake strategy on its head: now all of your entrants have a reason to share your product! Given the low-commitment level of sweepstakes (virtually anyone can win), they are best suited for frequent giveaways (eg: monthly) or for example to promote events (winner(s) get a free ticket). 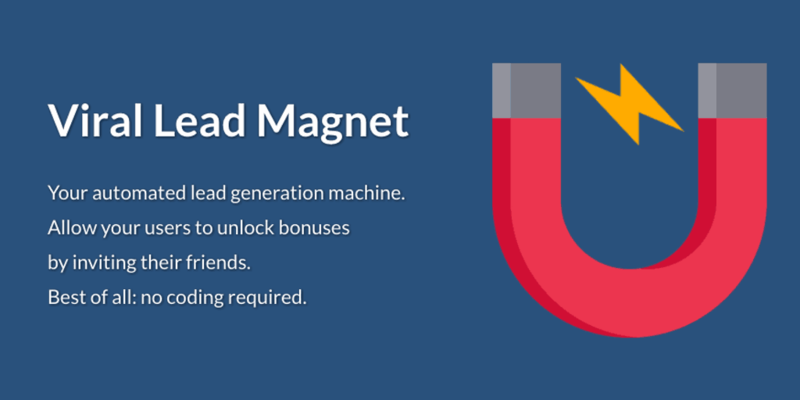 Viral Lead Magnets leverage gamification to create an engaging experience. You set up one or more bonuses; by referring others, people have the opportunity to unlock these bonuses and earn many different prizes. The more friends they refer, the more prizes they unlock. For example, you might have a bonus for referring 3 friends, and another for referring 10 friends, and so on. Unlike the Viral Waiting List or the Viral Sweepstake, with a Viral Lead Magnet, people don’t compete with others, but only with themselves. Given the lack of “pressure”, they are usually best suited for ongoing referral programs or Ambassador Programs, like the hugely successful TheHustle’s Ambassador Program (300K subscribers in a few months). Now that you have a better idea of our tools, let’s answer the question: which one is the right fit for my referral campaign? As cliché as it may sounds, the straight answer to the above question is: it depends. There is no such a thing as “the perfect referral tool”. Each tool is used in a different way and can give great or poor results depending on a few factors. While every referral program has the same goal (get more people to sign up and grow your email list), the psychological dynamics that each tool creates are totally different. For example, a waiting list is generally more geared towards a “competitive” audience where people compete with each other for the few prizes. If your audience or target market doesn’t have a competitive nature, a waiting list is unlikely to generate great results. On the other hand, maybe a lead magnet (where people don’t compete with others) might be the right tool. We have seen amazing results with all of our tools: Current has collected over 600K emails with a Lead Magnet, HolidayPirates nearly 200K with a Sweepstake, and Whistler over 70K with a Waiting List. The trick is to know when to use one rather than the other. The 3 main factors that you should consider when choosing a referral tool are prizes, frequency and dynamic. Your prizes are your incentives; the reason why people sign up to your campaign in the first place. I can’t stress enough how important it is to pick the right prizes for your campaign. I will write soon an article about how to pick the perfect prizes for your campaign. If you have one (or few) big and expensive prize, you simply can’t choose the Viral Lead Magnet because, in theory, everyone can win your prize. 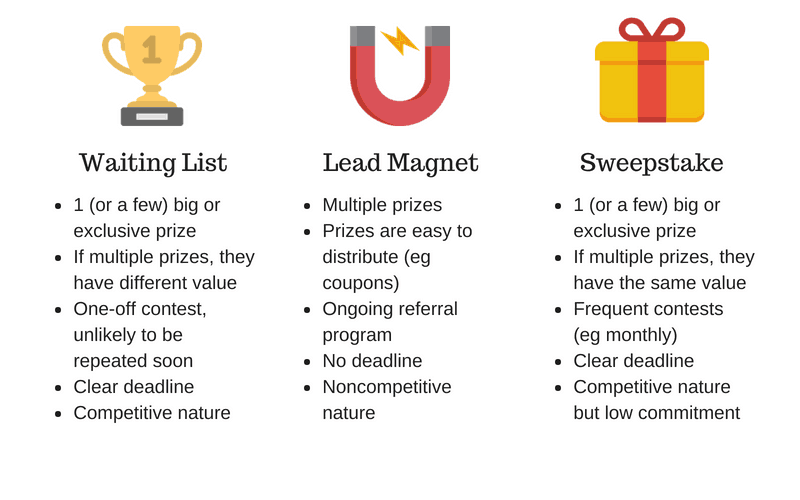 Conversely, if you have lots of smaller prizes a Lead Magnet is probably the best solution. The value of the rewards is another important factor. If you have multiple prizes but of different value (eg: a smartphone and 4 coupons codes), you might want to choose a Waiting List because it allows you to “segment” your prizes (eg: 1st in the list gets the iPhone, 2nd to 5th get a coupon code). Instead, if the value of your prizes is the same, a Sweepstake is probably a better solution because people are drawn randomly, hence there is no concept of 1st, 2nd, etc. Another important element to keep in mind is prize distribution. You should think about how simple/difficult it is to distribute your prizes. For example, if you have 1,000 winners it’s much easier (and automated) to distribute 1,000 coupons than 1,000 t-shirts. Therefore if your prizes are difficult to distribute you probably don’t want to use a Lead Magnet where everyone can win. A special case worth mentioning (because lots of pre-launch campaigns use it) is offering early access to your product/service as the prize. We normally discourage this approach because our data show a much lower referral rate compared to campaigns where people can win something. This is to be expected: unless you are the next Dropbox or Slack, offering early access is not going to make people overly excited. Besides, there might be such a big gap between when people sign up, and when they get early access that they might not think it’s worth it even if they are very interested in your product. If you still want to go ahead and offer early access to your product, then I recommend using the Viral Waiting list, which historically has been designed for exactly this reason. Another important factor to consider is how often you will run a referral campaign and long they will last for. Viral waiting lists are designed to be used as a one-off, “squeeze” your users’ network and enjoy the results. As such they have a clear deadline and are usually used to build-up momentum for something. As I’ve mentioned before, viral waiting lists tend to be more “competitive”, which means that by the end of your campaign your participants will have probably already spammed invited all their friends, and shared on all their social media. Viral sweepstakes also have a clear deadline, however, since they require lower commitment from participants (anyone can win by simply signing up), are far better suited for being used frequently. Some of our customers, for example, do a sweepstake competition on their website every month. A classic use of a sweepstake is a monthly raffle of free tickets, coupons or gadgets. Viral Lead Magnets, since participants don’t compete with others, and can potentially take as much time as they want, tend to be used for long-term, ongoing referral programs. If your question to the answer “When will the referral campaign end?” is “Why should it end?“, you’re definitely looking at a Viral Lead Magnet. A good example of an ongoing referral program is Ambassador programs for newsletters. “Dynamics” here refers to the behaviour you want to encourage during your campaign. Waiting Lists and Sweepstakes leverage on basic human psychological traits: artificial scarcity (the contest deadline) and peers pressure (the public leaderboard with the ranking). For this reason, they are normally best suited for audiences/markets that enjoy competition. You also might want to consider if generating competition amongst your users/customers is the right fit for your brand. On the other hand, a Lead Magnet is not based on competition (although you can display a leaderboard if you want), and generally doesn’t put any time pressure on the participant. It might be a better fit for more “relaxed” referral campaigns; ones that maybe grow a bit slower but generate results over a longer period of time.